I don't know where the time goes sometimes, it's been nearly a month since my last post--how does that happen? Well, there's canning apple sauce, apple butter, and cranberry chutney; there's lots of writing going on in other places--like work and Edible Finger Lakes; there's been travel, including lunch last week at Eataly New York, the new Italian mega-emporium in Manhattan. Groupon Syracuse is live! Haven't heard about Groupon? It's great. It's about coupons you can get emailed to you for local products and venues. Today's Groupon deal is you pay $5 for a $10 coupon to the delicious cafe at Earth's Own Natural Market in Liverpool. How cool is that? You can choose to get deals emailed to you for as many cities as you like--great if you like to travel. Sign up here. This weekend is the Pride of New York Harvest Fest Nov. 6-7 at the New York State Fairgrounds in Syracuse. There will be about 100 growers and producers there plus wine and beer tastings and local food products galore. It could be a great way to check out local foods that don't always get to store shelves--and purchase things for the holidays: a local foods basket is a great gift, don't you think? Tickets are $25 but stay tuned because I'm doing my first ever give away! For more about Harvest Fest click here. For the meat lovers out there, I've just received word about a Meat Fair--that's right, a LOCAL meat fair sponsored by the Cornell Cooperative Extension of Oswego County. It will take place on Saturday, November 20th, 2010, at the Central Square Middle School cafeteria, on U.S. Rte. 11 from 1 pm to 4 pm. Many different meat vendors from the area will be on hand to speak with consumers and answer their questions. Janet Wells, of the Farm House Kitchen Catering Company will prepare the different meat dishes for sampling; including goat, beef, pork and poultry. Cost to attend the event is $5.00. And now for some sad news...Wyllie Fox Farm is taking a hiatus from doing CSA shares for the next year or two. Jamie and Maggie are young farmers who have made an incredible contribution to the local foods scene--my root cellar is FULL of their butternut squash--and they fully expect this to be a temporary break. While we have been eating well thanks to the efforts of Jamie and Maggie and other small, local farmers, we must never forget how incredibly difficult it is for these farms to stay afloat IN A RECESSION. It is indeed a complex calculation to get the financial and human resources aligned to farm productively and small farmers have it particularly hard. It has never been more important to support our local food producers because without them--well, I'm not sure where I'd get the food that I count on to be grown sustainably and locally. Jamie and Maggie--we'll miss you but know that we are standing with you! Keep us informed and if there are ways this community--your community--can rise up and help in any way, let us know. Eat on, friends and eat well. I know exactly how it happened. I got busy and the beets began to pile up. They began to pile up on top of the piles of carrots. They were making it impossible to fit another celery root in the vegetable bin. I got too busy because...well, that's just how life is too often. You know how it is. But I couldn't let my busyness mess up all the good work the farmers had done--good, hard work. Six years ago I lamented that our produce CSAs (community supported agriculture farms) are mostly half-year affairs in our area. Over the past few years, several year-round CSAs have popped up--joining long-standing Blue Heron Farm in providing local produce all year long--but they are still rare for the most part. As I listen to some of my farmer friends collapse with gratitude at the season's end (especially this past difficult growing season) I'm not anxious to make them work any harder than they already do. I only recently figured out that if I can and freeze all the bounty that I get from June-October, I not only get to feast all year long on local produce but I effectively get a year-long CSA program. So one night a couple of weeks ago, I worked long into the wee hours scrubbing, sterilizing jars, and canning countless beets. I did it because I didn't want all those beets to go to waste. I did it because the thought of adding chunks of deep purple summer flavor to my winter meals just makes me happy. And I did it because I can think of no better way to say "thank you" to the folks who grew those beets than to eat and enjoy every one of them. It is, afterall, the least I can do. I guess I've had it easy up to now. When I grew vegetables over at Dorset Harvest Farm I had a huge spread of a garden--ten rows of vegetables and herbs. Way too much food for my family alone but plenty to give away. While I learned to deal with slugs and cabbage worms, it was rare that I had to mess with pests of the flying and crawling variety. As for animals, I was decidedly blessed. Deer were known to mow down the bulbs in the houses across the street from me but never found their way to the veritable buffet I had growing behind our house. The worst thing I encountered was a squirrel nibbling at a strawberry or two--and then, only rarely. Now I live west of downtown. With the Syracuse "skyline" visible from my porch it makes my last house feel like the suburbs. To add to the urban vibe, there is a warehouse behind our home that hasn't been kept up as it should. And therein lives my unwanted neighbors. I see them peering out from the large door that gives them a perfect view of my raised bed--furry, roly poly, what--woodchucks? They're a bit on the small side for that--or maybe they're just waiting to plump themselves up on my vegetables! Well, I'm not having it. We will have to figure out a way to peaceably coexist. I'm working hard to tend my newly constructed raised bed of lettuces, radishes, spinach, tomatoes, and soon--garlic and I intend to eat the fruits of my labors. One of us will have to forage a little harder for dinner tonight so the furballs next door are on notice--It will not be me! Now I'm off to send Harrison out to find a suitably attractive and effective enclosure for the raised bed. I've never subscribed to the "good fences make good neighbors" maxim but in this case I'm reconsidering. Sigh. Nothing clears out the city grit like a trip to a farm. Yesterday I traded potholes for cowpies with a visit to Creekside Meadows Farm in Tully. Harrison and I walked among a small herd of cows, watched the chickens and ducks run around, and played with these two guys--Twix and Thumper--just a couple of months old. I'll post more photos from the farm soon but couldn't resist posting this adorable pic. For more information about Creekside Meadows Farm check out their website. I've fallen in love with this new magazine out of Philadelphia called Grid. It's all about sustainability, local food, the local economy and the people, organizations, and businesses that are making it all happen. It is beautifully produced and full of inspiration. The April issue is focused on gardening and is full of inspiration and tips for those of us who dig their dirt in the city. Their article on guerilla gardening for food production is much in line with what our own Syracuse Grows and Slow Food CNY are trying to accomplish. You can check out the entire issue online here. The only problem with Grid magazine is that it is Philly focused--but good for them. Perhaps we'll have one of our own someday. 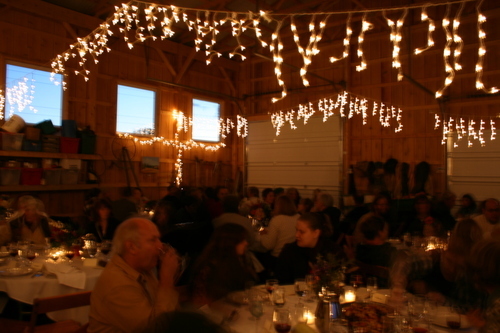 Back when the notices first went up for the Harvest Dinners to help support Healthy Food For All--a program that makes CSA membership accessible to families in need with partial subsidizing of the fees--I knew I had to make a reservation. I like to think of it as eating well so others can simply eat. As it happened, the only one that fit in my schedule occurred tonight--right near the start of the Eat Local Challenge month. Under the warm lights of Stick and Stone's new barn 100 or so producers, farmers, chefs, coffee roasters, vintners, and lovers of seasonal, fresh, delicious food gathered to partake of an incredible four-course meal. Wines from Silver Thread Winery were generously poured, while a menu that included home crafted pork sausage, black, navy, and red bean soup finished with arugula and sumac scented yogurt, roasted delicatta squash filled with root vegetables and green beans, and a spit-roasted lamb and braised goat with honey braised fal greens were passed family style around the table. A star anise infused white wine candied apple with quince paste and smoked cheddar completed the meal. Oh yes, Gimme! Coffee was served up as well. Some of us even took a tour of the Gimme! roastery before the dinner. What a night! Special thanks to all the farmers who donated foods (I sat with John and Marion Wertis who supplied the goat). And kudos to Chefs Hans Butler and Bernie Oshaben of Watercress Restaurant, Ithaca, for turning an abundant harvest into a feast. Thank you sun--now bring on the tomatoes! Have you noticed? We've finally had more than 2 consecutive days without rain. On the one hand, all the rain has been great--I've only had to water the garden about four times all summer. But all that rain has my tomatoes big, beautiful, and green. They're supposed to be red or orange or yellow by now. It's gotten so bad that I've actually had a nightmare involving someone kidnapping my hard, green tomatoes and taking them off to some sunnier state. Luckily, it was just a nightmare and the sun has returned. Until my own tomatoes ripen I'm relying on area organic farmers to supply me with small numbers of greenhouse tomatoes, Early Girls, and juicy Orange Blossoms. 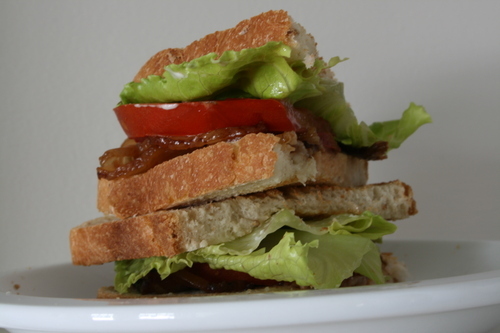 If it were not for them I'd be bereft of one of summer's most simple and delectable pleasures--the BLT! Thanks friends! This is the height of the summer produce season here in Central New York and aren't we lucky to have so many sources from which to get our fresh food? After being out of town for the past few weeks (month?) I'm looking forward to stocking the larder and catching up with the peas, beans, berries, peaches, and tomatoes (finally!) that are starting to come to market. We have some great options each week in the Syracuse area but here are a few that are special occasion or may have missed your radar. 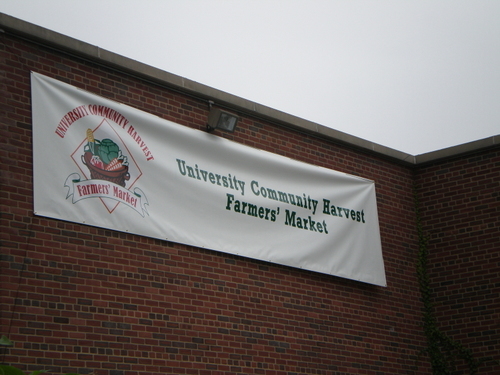 The Syracuse University Community Harvest Farmers' Market is open today from 10:00 am to 3:00 pm in the Waverly parking lot--that's the lot at the corner of Waverly and Crouse. There will be local farmers and producers, books for sale, information tables, and lots of prepared foods as well. Even if you plan to do your market shopping tomorrow, come and check out this one--it is the second of four markets that SU will host this season--and we want them to add more!!! The Greener Bean Market in Skaneateles is open Saturdays from 8:00 am to Noon in the P&C parking lot. It touts itself as New York's premier 100% organic farmers' market and features produce from Black Brook Farm. I haven't checked it out yet but because making the Skaneateles farmers' market on Thursday is difficult for my schedule, it's nice to know there is another option during the week. I hope to get there tomorrow. CNY Regional Market. Okay, you already know about this one but here's a different spin on the idea--leave the car at home and bike there! I have several friends who bike from the Westcott/University Hill neighborhoods and I've been envious of their sustainable habit (and guilty of my carbon waste habit) as I drive there each Saturday. Well, a ride has been organized to go the Regional Market tomorrow by the local Sierra Club chapter. Meet at the Thorndon Park swimming pool parking lot at 9:30 am. "Ride is about 10 miles and kids accompanied by adults who can do this at around 7-10 mph are welcome. Helmets required." For more information call 428-1905. No charge. See you at the markets! Would you pay someone to grow food in your backyard? Today's New York Times ran a cover story on folks who are willing to pay someone to install a vegetable garden, weed, tend, and harvest the produce growing in their own backyard. You know I had to comment. 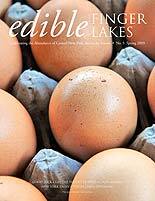 Check it out on the Eat Local Challenge blog. I promise, I promise I'll get to the post on my NYC cheese hunt but the garden has been calling and it won't wait. Yesterday I pulled out some 30 beautiful bulbs of hard neck garlic and set them out to cure for a couple of weeks. I trained up my tomatoes--snacking on the first round of ripe Sungolds as I worked. I love how they are the first to come in and the last to go out. And I've been eating a mix of mesclun, French breakfast radishes, and wasabi greens with nearly every meal. To add a little variety and creativity to this week's meals I'm going to get myself to this month's Eat Local Potluck. This time around we'll gather on Sunday, the 20th at Wake Robin Farm at 7:00 pm. These meals are always a feast of the best our area has to offer--even in December. So just imagine what will be on the table this month. Plus, the opportunity to gather at the farm that produces some of the best yogurt, milk, and now, cheese in our area is an added bonus. Just bring a dish to share prepared with locally grown ingredients. For location and directions please drop me a line (click on the email link above right).